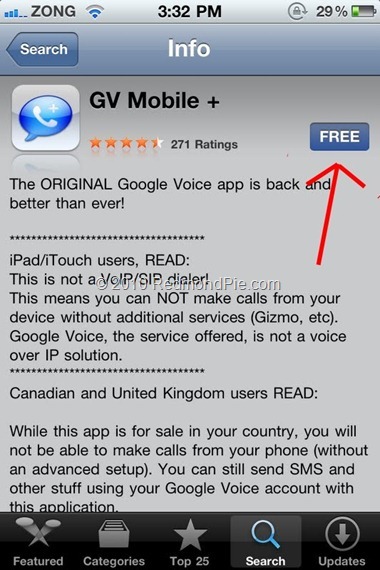 Google Voice App "GV Mobile +" is FREE for Today! Go Get it Now! In light of the recent relaxed App Store restrictions, Apple has started allowing previously unallowed apps into their App Store. The biggest beneficiaries of the relaxed restrictions were Google Voice apps which weren’t allowed before (since they duplicated features that iPhone comes with). We posted about two such apps: GV Connect and GV Mobile+. Both cost a very reasonable $2.99. But today, we have received information that GV Mobile+ is available for free just for today! So all those of you who were holding out from buying a GV app cause it cost real money can go ahead and download it right now. Just search for "GV Mobile +" in the App Store or follow the direct link posted below.